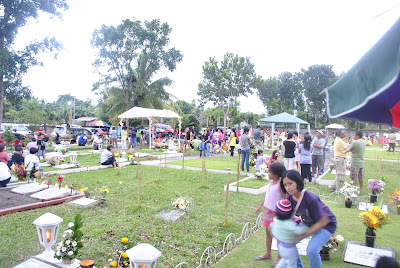 Silay celebrates All Saints and All Soul's Day in much the same way as the rest of the country, except for one difference...all of it's 3 cemeteries are located within walking distance of each other. There is the public cemetery (Cementerio Municipal), the Catholic Cemetery (Patio Pari) and the privately owned Lasting Peace Memorial Park. Ledesma St. (formerly Mckinley St) from the corner of the public cemetery to the corner of the parish cemetery is closed to traffic, so that all vehicles going to the airport are advised to take the Locsin St. (formerly Freedom Blvd) route. 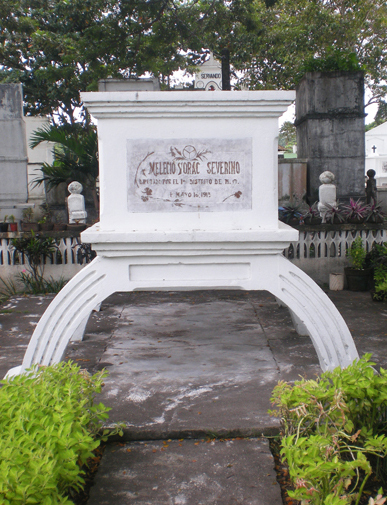 The tomb of Melecio Severino, a hero of Cinco de Noviembre 1898 and the first governor of Negros, is found right at the entrance of the Cementerio Municipal. The Silay public cemetery is composed of two areas, the necropolis (those with tombs) and the potter’s field (those without tombs). It has also the boneyard used for unidentified old cadavers buried in the potter's field exhumed by the cemetery authority. The Silay Catholic Cemetery was probably started at about the same time as its first recorded Catholic Church in the 1780's. This is where the dead of prominent families were buried or families who could afford to buy burial lots from the church. Here, you can see old mausoleums, as well as new ones. There is no one buried below ground in this cemetery because there are no facilities for it. Lot prices here have remained affordable so that even the middle income families can now acquire lots here...but of course, they have to be Catholic. And last but not the least is the Lasting Peace Memorial Park and Chapel developed by the late Jose Maria Locsin. 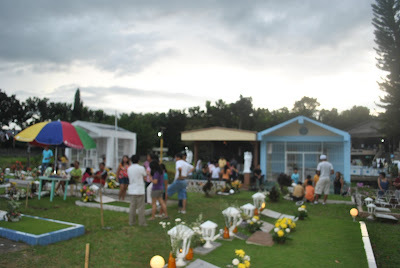 It is a typical memorial park with both below and above ground burial lots. There is also what they call the "condominium" which is basically just burial vaults at the side and on top of each other. The area for the below ground burial lots is elevated and each vault is cemented up to the ground with very good drainage. My family bought our below ground lots years ago when it was still relatively cheap. When my father died in 1991, there were only a few people buried in our area...today, it is almost full...and the lots are now expensive! In October 2, 1899 - Eight months into the protracted Philippine-American War (1899-1914), the invading Bald Eagle nation sponsors the first elections under the Negros Constitution, with revolutionist Melecio Severino, who fought both the Spaniards and the Americans, being elected civil governor; the imperialist United States officials, however, fearing Severino's anti-Americanism, would soon undemocratically arrest him and appoint Jose Luzuriaga and, later, Leandro Locsin, to take his place as civil governor.